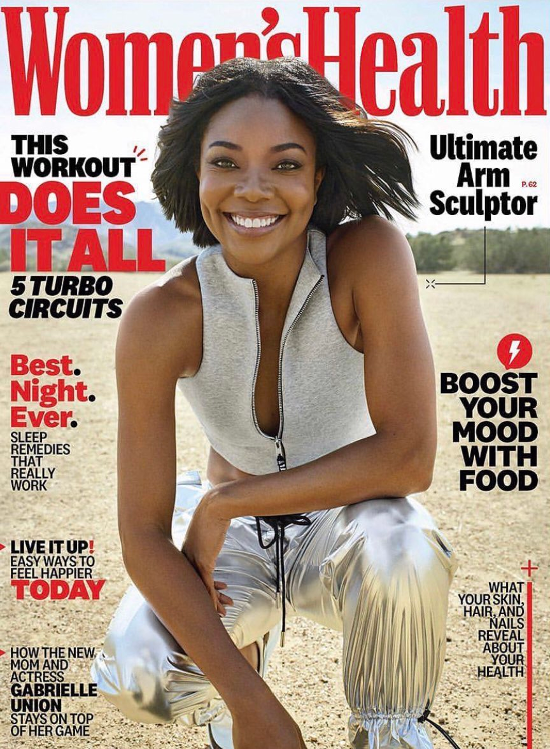 Gabrielle Union is FIT. FAB. FORTY PLUS. And FIERCELY killing it. We're green with envy, but in a good way. Three months ago, the "Being Mary Jane" star became a first-time mom at the age of 46. And she surprised the world because no one knew she and her husband Dwyane Wade were expecting a baby. It was a long and hard road for Gabby and D. Wade, but her dream of becoming a mother finally came true when her baby girl Kaavia James Union Wade made her arrival. “There’s nothing more that I wanted than to cook my own baby,” she tells Women's Health magazine in their March 2019 issue that she fronts. The Think Like A Man star suffered 8-9 miscarriages and underwent three years of failed IVF treatments, so you can imagine how ecstatic she was when Kaavia finally entered the world. The YBF actress - who also helps raise D. Wade's sons from other relationships and his nephew - got down to three embryos, so surrogacy seemed like the best option. However, she wasn't really feeling the idea in the beginning. “The idea of it felt like surrendering to failure,” Gabrielle says, when speaking about welcoming a surrogate into their lives. Yet she pushed past those emotions and shifted to focusing on finding the right woman to carry her baby. “Some people care about the race, religion, or food habits of their surrogate. I was like, ‘I want a reader.’” When Gabrielle met a potential surrogate who shared her love of books, she knew she’d found the one. “She said, ‘I love the smell of the pages,’” remembers Gabrielle. It was the sign she needed. The Bring It On actress reveals she was terrified over how people would react to her using a surrogate. While she has been trying to have a baby for the longest, she says welcoming her baby in her 40s was the perfect time for her. As for her incredible bod, she reveals she's trying to stay consistent with a healthy eating pattern, she adds 15 to 20 minutes of daily cardio, plus strength training and Pilates. She prefers early morning sweat sessions due to her schedule. It keep her body fit and her head clear. Gabby - who will star alongside Jessica Alba in the new Bad Boy spin-off television series "L.A.’s Finest" this May - also shares her self-care routine, which includes finding a moment alone to enjoy some quiet time (“I appreciate silence”), reading (“Let me just get a chapter in”), and listening to Affirmation Pod by Josie Ong. By the way, the final episode of "Being Mary Jane" premieres April 16th. Iman is a LEGEND. There's no denying it. Not only was she killing it during her prime, she's still out here slaying magazine covers. Effortlessly. YOSSSS! Come on thru legendary baddie! The 63-year-old legendary model covers InStyle magazine's March 2019 issue in a wet white t-shirt. And guess what? It was totally her idea. A true fashion queen indeed.